My comics from the past two weeks are all mixed up so this is two weeks’ worth of comics all mixed up. Not that it’s probably worth noting that they’re “all mixed up,” since it’s not as if I review these things in any kind of order. 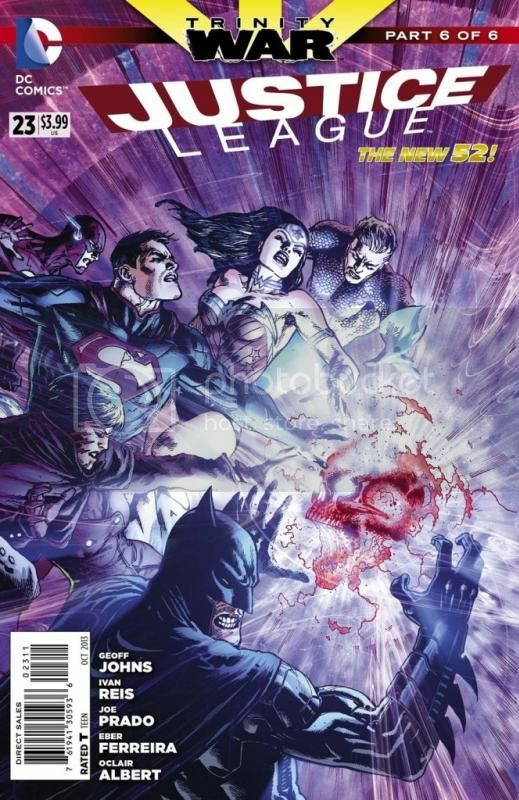 Speaking of order, that leads me to Justice League #23, part 6 of 6 in the Trinity War, but the first issue I bought. That’s out of order! I avoided Trinity War from the start for several reasons. 1) I had dropped Justice League a while back because I had stopped enjoying it. 2) I dropped Justice League of America after issue #1 because I never enjoyed it. And 3) I have never had any interest in reading Justice League Dark. So when you put it that way, I’d be pretty silly to start reading this crossover! It’s like “Hey, here’s a big story that crosses over between three books you don’t read!” And then in case that sold me, Doom DeLuise’s review was the nail in the coffin. That said, supposedly Trinity War was what was leading into Forever Evil, and I suppose I’ll have no choice but to read Forever Evil tie-ins, so I was curious enough to pick up this issue. It was okay! I love Ivan Reis’ art. My lack of familiarity with most of the characters didn’t matter (I’ve known many British people over the years. I lived in England for a year. I’ve never known a single British person to actually say “Blimey.” But I can tell Constantine is supposed to be British, because that’s how Geoff Johns writes him! See, you can get to know these people right away) because the action was easy to follow — except for when I had to keep turning the book sideways for those double-wide splash pages that were vertically oriented. This was embarrassing because I was reading my comics in public (sometimes already embarrassing enough) but then I kept having to turn the book sideways, and I was wondering if people thought that my comics had a centerfold in them.